Here at the Center for Engineering Learning & Teaching (CELT), we are always interested in the topic of reflection, and have been working to uncover more information about the trends of reflection in general. A current project is focused on examining the trends of reflection in the American Society of Engineering Education (ASEE) conference publications. Our question is, how much explicit, named attention has reflection received in engineering education scholarship and how do we interpret these results? Our initial approach examined the explicit references to reflection in the ASEE conference papers since its inception by manually sorting through the papers for words relating to reflection. The resulting trend is quite impressive. 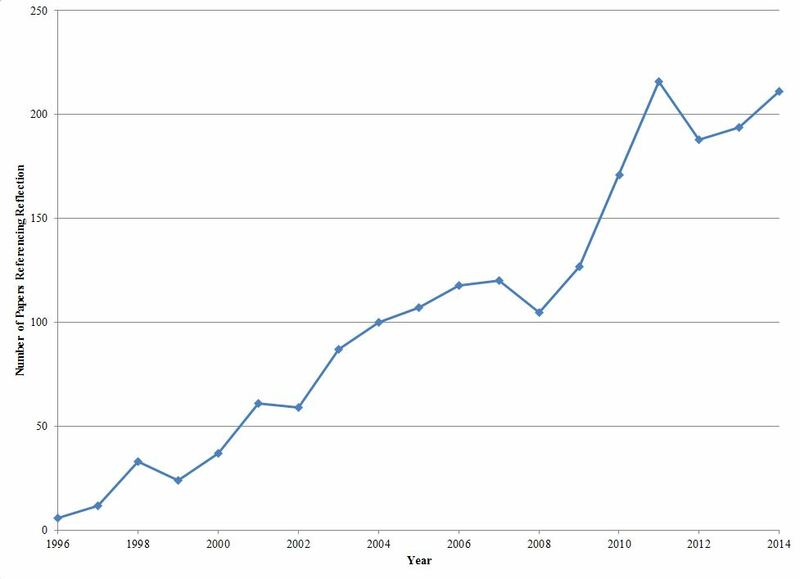 Since 1996, there has been a steady upward growth of papers mentioning reflection. In 1996, only 6 papers mentioned reflection whereas in 2014, over 200 papers mentioned reflection to varying degrees. Some papers mention reflection briefly as they explain how students were asked to write reflective essays, where other papers explicitly call out and highlight the importance of reflection in engineering education and furthermore link its importance to transforming students. “Reflective practices are one method for transforming students and helping them to become more open to taking challenges and integrating them into new applications.”  Whether the papers make bold statements regarding the effectiveness of reflection, or simply mention small reflective activities, the broad acknowledgement of reflection is a tell-tale sign that more educators are recognizing its importance. We are excited to present the results of these findings at the ASEE Annual Conference next month. The Consortium to Promote Reflection in Engineering Education (CPREE) is partnered with other educators to majorly contribute to the conversation on reflection – we want to bring to light the importance of reflection as a tool to improve student educative experiences among other things. As we collect reflective activities and practices across our 12 unique campuses, we have the privilege to sit in the front row, watching how reflection is changing the face of engineering programs. T. R. Forin, “A Personal Account on Implementing Reflective Practices,” in American Society for Engineering Education, Indianapolis, 2014. Using a qualitative methods approach, Boswell explored students negative reactions to structured reflections on a service-learning trip. In the background chapter, Boswell provides an extensive review of the reflection literature, generally and then more specific with respect to service-learning. In the empirical part of her dissertation, Boswell focuses on students’ reactions to structured reflection activities. After a day of service, students engaged in conversation around a campfire. During these conversations, there was a purposeful stop and reflect time with activities. Her findings suggested that these structured reflection activities detracted from students’ organic engagement with reflection. Think about stakeholder’s roles. In the literature review chapter, Boswell provides an interesting discussion of the role educators and students play in reflection activities. She notes that the educator role shifts from one of authority figure to one of coaching, facilitating, and advising. Students should take more control of the situation and depend less on educators. The relationship between the educator and students is defined by mutual interdependence; students must shift from being “passive recipient[s] of knowledge to active creator[s] of learning” (p. 23). Such changes have significant pedagogical implications for the ways in which educators configure a class and how educators interact with students. Understand the difference between reflective thinking and reflection activities. She notes in her literature review (and returns to this idea through the dissertation), that a significant confusion related to reflection is between the action and a structured learning activity– “Because reflection is both a cognitive process and a structured learning activity there is a certain amount of ambiguity about the term (Hatcher and Bringle, 1997)” (p. 24). Be aware of things that contribute to reflection structure traps. Based on her findings, she suggests that there are four things that contribute to making reflection feel forced– “the structure trap”: “too narrow or too general; when transitions feel abrupt and interrupt informal reflection already occurring; when students feel put on the spot; and when they are not individually prepared and/or motivated to reflect” (p. 118). Schön. While scholars introduce these theorists, the language of these theorists doesn’t map to what scholars use. For example, Dewey uses the language of making meaning of experiences (e.g., fragmentation and continuity of experiences). In the end, it’s important to note that there are some assumptions (or discourse community assumptions) that are connected to using these foundational theorists. Think about the disconnect of her findings to realities in teaching. From her account, reflection is a profound component of learning. However, if reflection is such a profound component of learning, we can question why reflection is silenced is most other learning experiences? Boswell, L. (2010). The Structure Trap. Students’ Perceptions of Reflection on a Co-curricular Immersion Service-Learning Trip. (Doctoral dissertation). Humboldt State University, Arcata, CA. Reflection activities can happen in many contexts and can be used to develop community among students. Sonya Cunningham, of the University of Washington shared with us her activity “Have you made good choices today?” and it was also highlighted by the Seattle Times. See the article below! even being an A student isn’t enough for a young person to reach her potential. Ewurama Karikari and Trinh Ha were both top students in high school. Mount Tahoma in Tacoma for Ha and Bethel High School in Spanaway for Karikari. The freshmen made the winter-quarter dean’s list at the University of Washington, but might not have even attended the UW if not for a little help. Being there is good for their futures, and good for the UW, too. Eve Riskin, professor of electrical engineering, told me the problem-solving work that engineers do benefits from the diversity of approaches that different life experiences create. Riskin is also associate dean of diversity and access in the College of Engineering. And she sent me a note about a program just in its second year, called State Academic Red Shirt or STARS. She’d just gotten the winter-quarter grades and told me 11 of the 30 STARS students made the dean’s list. The Times wrote about the program last fall, but it’s been fine-tuned, so I asked what’s getting results. The key ingredients are students who have shown they can stick to hard tasks, and a staff that brings tough love and high expectations. We all know how competitive that access to the best education has become, and the stakes just keep rising. That’s particularly true in STEM (Science Technology Engineering Mathematics) fields and at the most selective universities. STEM programs cry that they’re not getting enough students, but they turn away large numbers of applicants because they want students who come out of high school prepared to plug into their programs without a hitch. And that means they admit few students from low-income families who are likely to live in neighborhoods where educational opportunities are not equal to those in more upscale areas. The UW College of Engineering isn’t where it wants to be, but is more diverse than most of its peers because it makes an effort to bring in both underrepresented minority students and women. A few years ago, I wrote about the college’s summer program for high-school students, Math Academy. It gave students a boost, but four weeks in the summer wasn’t quite enough to draw as many students into the college as it wanted. So the UW adopted the STARS idea (Washington State University did, too), paying for it with temporary grant money, primarily from the National Science Foundation. Sonya Cunningham, who runs the UW program, said she gets a list in January or February of students who are applying to the UW as freshmen, and who attend schools with a significant percentage of low-income families. She has current STARS students call them and talk up engineering. Then Cunningham evaluates them, looking for one trait in particular: perseverance. If they have good grades and grit, they have a good chance of succeeding in the intense program. The students I spoke with said math work in the program was harder than they expected and even more challenging than what they later faced in class. The intent is to quickly get them up to where they need to be to compete with students who’ve had more math programs, a higher level of instruction and extracurricular enrichment. Their first quarter, students get lessons in how to negotiate college, how to fit in with the culture. They work on academic and study skills. Cunningham does proactive advising to head off potential problems (“Have you made good choices today?”), and from the start she molds them into a supportive community. She brought them together the week before classes started last fall and gave a $50 gift certificate to the first person who learned everyone’s names. Two students fell behind during the fall quarter, and Cunningham applied some tough love. Some tears were shed, but the next quarter both were doing better. One of them went from a 2.2 GPA in the fall to the dean’s list in the winter. Karikari is interested in getting a Ph.D. in mechanical engineering, and Ha is interested in renewable energy and wants to work in industry. It’s a good bet STARS will help them realize their dreams. The concept of reflective learning may spark some initial apprehension on the part of educators and students. But once they try it, they quickly see that it works, according to research and widespread practice. Students – in fields from engineering to dance – deepen and strengthen their learning when they contemplate the material they have just learned to find its meaning and connections to past courses, lessons or experiences. In other words, reflection helps students connect the dots. Learning through reflection in college prepares students for the “real world” after graduation. “Employers are looking for students who are able to retain and make connections across contexts,” said Cindy Atman, director for the UW Center for Engineering Learning & Teaching and professor in Human Centered Design & Engineering. Reflection can support student learning – in any field of study, according to Atman and Betsy Cooper, divisional dean of arts in the College of Arts & Sciences and professor in Dance. Atman and Cooper will give the keynote presentation at 3 p.m., Tuesday, April 14, during the UW Teaching and Learning Symposium in the HUB Ballroom. The symposium begins at 2 p.m. and ends at 4:30 p.m., with the keynote taking place between the two poster sessions. The symposium will highlight some of the UW’s most innovative research and practices in teaching and learning as more than 80 faculty, staff, and students from nearly 40 departments and units across all three UW campuses present 42 posters that detail their research methods, results and implications. Interim Provost Gerald J. Baldasty will give the welcoming remarks. Poster presentations range from the impact of active learning spaces on student learning to incorporating art into assignments in social science courses to shortening doctoral students’ time-to-degree by providing writing support. Hosted by the UW Center for Teaching and Learning, the symposium is open to the entire University, and no reservations are required. Atman and Jennifer Turns, professor in Human Centered Design & Engineering, direct a consortium comprised of 12 campuses across the country to implement reflection in engineering classrooms. Funded by a grant from The Leona M. and Harry B. Helmsley Charitable Trust, the Consortium to Promote Reflection in Engineering Education is interviewing educators about the reflection activities they use with engineering students. These activities include short, in-class reflection activities on how students used their day and student portfolios. Another form of reflection is an “exam wrapper,” in which students reflect on how they prepared for exams and how they performed. Then, students identify strategies to improve. The center staff will present a poster at the symposium with a sampling of reflection activities that local engineering educators are using, along with the rationale and benefits. In the generative and performing arts, the most common means of reflective practice occurs through critique, Cooper noted. “This can mean self-critique, instructor or peer. It is common that all three are interwoven in a process,” she said. Through repetition and revision, based on the critique, an artist refines his or her technique and expressivity. Other reflection methods in the arts include journaling, reflective essays on class progress and reflective essays on a portfolio. By establishing goal statements at the beginning of a dance course, Cooper’s students can create strategies to meet those goals, as well as revisit and revise the goals throughout the quarter. The benefits of reflective learning extend throughout students’ professional lives as they can incorporate reflection into their individual work strategies and practices. “Reflective practice can be a potent means for continued growth, and an antidote to burnout,” Cooper said. Many days I like to see what is happening in the world related to reflection, for example, how is that word operationalized in the news? How about with regards to the latest technologies? As I searched around recently, I found an interesting article linking dreaming to reflection. A recent study was conducted about the links between what is referred to as ‘lucid dreaming’ and those who frequently practice self-reflection. Lucid dreaming is the idea that one can be dreaming and consciously realize that they are in the dream state – able to control movements and responses within the context of their dream. Lucid dreaming is opposed to rapid eye movement (REM) sleep which is commonly associated with dreaming where an individual has “complete lack of insight into the true state of mind.” The researchers recruited participants and monitored brain activity both through structural and functional MRI. Interestingly enough, those with increased lucid dreaming capabilities displayed a higher amount of grey matter in a certain part of the brain, among other differences. Incorporating reflection into engineering education is not simply a move to help students to think more broadly about their education, but could these techniques help students to become more insightful about many other important parts of their lives? If self-reflection can promote lucid dreaming abilities and physically shapes a portion of the brain, what else can it do? E. Flievich, M. Dresler, T. R. Brick and S. Kuhn, “Metcognitive Mechanisms Underlying Lucid Dreaming,” The Journal of Neuroscience, vol. 35, no. 3, pp. 1082-1088, 2015. “Lucid dreams and metacognition: Awareness of thinking – awareness of dreaming.” Max-Planck. 20 Jan. 2015. I had the pleasure of visiting Clarkson University in Potsdam, New York. On this campus visit, I met with a number of educators and campus leaders to talk about CPREE. On my visit to Clarkson University, I hosted a half day workshop—“Reflection in Engineering Education: Creating a Reflection Mindset.” In this workshop, I (1) engaged participants in a rich pictures activity as a way to collectively define reflection; (2) offered our CPREE definition of reflection; (3) explained the goals and activities of CPREE; (4) shared emerging reflection activities; and (5) engaged the participants in developing a reflection activity. In this workshop, reflection seemed to resonate with the educators. This attitude was evident in the way the educators actively engaged in conversation about the topic, readily offered examples from their classroom, and actively engaged in developing a reflection activity to implement in their teaching. When the educators worked in groups to develop a reflection activity, they developed creative reflection activities (e.g., crib sheet preparation as a reflection activity, muddiest point in large lectures, etc.). When the group talked about one specific activity, individuals in the group were able to modify the reflection activity to fit the needs in their course. What was evident in all my conversations with educators and leaders at Clarkson was a passion for both technical research, as well as engineering education research. As an institution, Clarkson has strived to be student centered, but much of this mindset has come from natural intuition. More recently, they have recognized the importance of grounding their education practice in best practice that is based on the literature. This shift is evident in the types of deep questions educators and campus leaders are asking about teaching and learning. I thoroughly enjoyed helping these educators think about their teaching and learning. I look forward to seeing Clarkson University emerge further as leaders in engineering education research and I hope to continue this partnership that we have started through CPREE. Originally from Tamara Rosier, a leader at the consultancy Acorn Leadership, “knowledge ratings” require students to be focused on their understanding of class material while the class is in session. Students are asked to rate their knowledge on a scale of 0-3, with 0 indicating not knowledgeable. By the end of the class, the goal is to have each student recording a score of 3. Mid-way through the class period, the instructor takes a break to evaluate where they are at. The instructor will ask students what gaps they have preventing them from achieving a 3. A discussion ensures and the remainder of the class is focused on closing those knowledge gaps. If metacognition leads to “better learning” as David suggests, how are we facilitating these ideas in our own classrooms? By shifting the intellectual responsibility to the students, can we enable them to become more self-aware, more responsible for their own learning, and better situated for life after college? No doubt, these metacognitive and reflective practices can only help students to achieve the aforementioned qualities. So let’s follow his charge and continue to explore what it looks like to facilitate metacognitive and reflective practices in the classroom not only for the sake of the students, but for the sake of the educators too. As a CPREE campus partner, Georgia Tech’s CPREE efforts are based out of the Center for the Enhancement of Teaching and Learning (CETL). This characteristic means that the Georgia Tech CPREE team brings a unique perspective to the consortium—supporting different groups of educators in reflection activities. For example, when an educator engages with a CETL education developer the consultation is led as a reflection activity—asking the educator to look back at a past teaching experiences in service of improving future teaching activities. On my visit to Georgia Tech, this culture of reflection was evident in every CETL activity. From my visit, I would like to highlight two memorable moments from my trip: (1) hosting a brown bag with graduate students and (2) co-facilitating a workshop about reflection for educators. On my visit to Georgia Tech, I had the exciting opportunity to meet with a passionate group of graduate students. In this brown bag, I talked about work from my dissertation, specifically “Becoming self-authoring: Navigating your graduate career” (see Sattler and Turns, 2015 for more information about self-authorship). What I found promising from this conversation was the fact that graduate students resonated to the idea of becoming self-authoring in their graduate education. Not only did they resonate to the idea, they also brainstormed a number of ways they could start being self-authoring. While they were already strongly aware of their socialization to graduate school—the “should’s”—most of them were struggling with stepping outside of their graduate school experiences and observing them. This conversation provided these graduate students with powerful concepts that will help them navigate their graduate career and even their future career. Reflection is already a significant part of CETL’s mission at Georgia Tech. It will be interesting to see how they more purposefully talk about and support reflection. Sattler, B. and Turns, J. (2015). Preparedness Portfolios and Portfolio Studios: Supporting Self-Authoring Engineers. International Journal of ePortfolio, 5(1), 1-3. When people say the name Rose-Hulman, they often associate the institution with unique characteristics—a caring family, educators who are connected to their students, and educators who put their students at the center of their teaching practice. On my visit to Rose-Hulman, these characteristics were evident in every conversation I engaged in with educators to staff and even to students. On my two day visit, I had the wonderful opportunity to meet with a number of individuals and the conversations in these meetings included: what is reflection, how do we implement reflection into our teaching, how do we evaluate reflection in our teaching, is this [insert activity name] a reflective activity , how do we implement reflection into an already full curriculum, how can I get involved in CPREE activities, and many more thought provoking topics. The evidence of dedication and passion for teaching and learning was evident through the deep questions educators, staff, and students engaged with me about. While all of these conversations included many meaningful highlights, I want to emphasize a few of these interactions in-depth: (1) engaging with engineering undergraduate students about their engineering education research and connections with the CPREE efforts; and (2) observing CPREE activities come full circle to impact classroom activities. Historically, it has been less common for Rose-Hulman undergraduate students to be involved in engineering education research. More recently, students have become more interested in the topic and actively involved in engineering education research. On my campus visit, I met with Katelyn Stenger, Mechanical Engineering senior, and Chris Gewirtz, Physics Engineering senior. First, what stood out to me about my discussions with Katelyn and Chris was their understanding of highly intellectual topics—metacognition and reflection. Next, these two students described their research in knowledgeable, meaningful, and passionate ways. Throughout our conversation, I enjoyed helping them make connections between their research and the CPREE efforts. In the end, the connections that Chris and Katelyn were making between the engineering education research and the CPREE efforts at Rose-Hulman were quite sophisticated in nature. I am excited to see the mark both of these fantastic engineers will make! Another highlight from my trip was seeing CPREE efforts impact classroom activities. The first evening I went to dinner with campus PI’s Patrick Cunningham, Ella Ingram, and Jay McCormack. During our conversation, Patrick talked about a reflection activity he wanted to implement the next day in class. During this conversation, we gave him suggestions about the activity, even pointing him to a relevant CPREE field guide entry. (Note: Field guide entries represent a reflection activity an educator has used in the classroom. By the end of year 1 of CPREE, each campus partner will have a field guide with at least 10 field guide entries.) Before the class session in which Patrick planned on implementing the reflection activity, he read the field guide entry and adjusted his reflection activity based on what he learned. The next day, I had the opportunity to observe Patrick’s class and his implementation of the reflection activity. It was an exciting to see CPREE come full circle to impact classroom activities! Another characteristic of Rose-Hulman that stood out to me was the nature of the questions asked—deep, thought provoking, and passionate questions. In every conversation I had, educators, staff, and students engaged me in meaningful conversations about teaching and learning. I now know that the next time I visit Rose-Hulman, I better have my thinking cap on! I look forward to my next visit to Rose-Hulman. Over the last four or five years there have been a number of changes on the ASU Polytechnic campus. They have experienced name changes, consolidations, exponential growth in the number of students, etc. Even with a record number of changes, they are continuing to focus on students and what it means to support deep learning and students’ ability to transfer their learning to different contexts. On my visit to the Polytechnic campus, this mission was evident in every conversation I had. Educators were asking engaging questions—how do we integrate reflection across multiple sections of the same course, how do we integrate reflection across the curriculum, how do we reach engineering educators who are not interested in supporting student reflection, and what is the evidence base for reflection in engineering education? The depth of the questions shows that many educators at the Polytechnic campus already value the use of reflection in their classroom, and they often integrate reflection activities into their teaching. Overall, this was a great campus visit—Kristy and Adam are off to a fantastic start on the polytechnic campus! They are even starting a reading group around Linda Nilson’s book—Creating Self-Regulated Learners: Strategies to Strengthen Students’ Self-Awareness and Learning Skills. During their second year of CPREE, they plan on reaching out to the ASU Tempe campus engineering faculty. While potentially challenging, this is a unique opportunity to reach a different population of educators—educators who may be a little more resistant to reflection in engineering education, educators who may be focused more on technical research, educators who may be focused on teaching the technical content, and educators who may want a strong (quantitative) evidence base for reflection, etc. I look forward to the exciting things Kristy and Adam have planned for their campus—a book club, mini-faculty grants, “train the professor” activities, and many more!